“In our living room on our farm at the moment we have a Christmas tree, covered in the usual lights, tinsel, and other decorations. Now for people who don’t know us there is nothing at all strange about this. 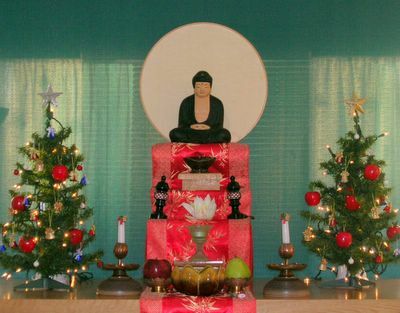 However, our friends and family do sometimes wonder what Zen Buddhists are doing with a Christmas tree in their house. Well, actually although it looks just like a Christmas tree it is for us a Buddhist Jewel Tree, and we are celebrating the Buddha’s Enlightenment. The Festival of the Buddha’s Enlightenment is traditionally observed on December 8th, but we take advantage of the season’s celebrations to decorate our house throughout the rest of December. The decorations represent in visual form what the world looked like when Buddha realised enlightenment and so they represent what it can look like to us if we see with the eyes of Buddha, and this in fact is something that is open to any of us to do at any time. Now it is probably quite sensible to understand this imagery in a metaphorical way. We often notice that our ideas and emotions stop us realising what is really going on in a particular situation. Indeed, we can be so caught up with ourselves that we hardly notice what is going on at all. If we can manage to stop looking at the world through our own fears and insecurities, clouded by the grasping after things, the anger and confusion that so frequently fill our minds, then the world truly presents itself in a very different way. In fact what we can then see is a tremendous love, compassion and wisdom in all people, all circumstances and indeed all things. So, in one sense the jewels on the tree symbolise this love, which shines through all things. And in another sense we can often see these jewels more directly. When we look with love, sympathy and understanding at people their eyes sparkle as jewels. And some people find that the world can take them by surprise and break through their personal worries and concerns. Clear night skies, light on the waves of the sea, morning mist hanging in a valley, houses, hedgerows, trees and fields covered with snow, even rain droplets hanging like jewels on the winter branches of a tree. All these have the capacity to speak directly to our hearts. And what they say is that we are not separate from the world or from anything in it. Andrew that was great, thanks for giving permission to publish your words. Here is the priory altar, with jewel trees.